For the Holyweek, my group (PALMC) had a long scheduled climb for Mt. Guiting-Guiting (G2 on Mountaneering Lingo) in Sibuyan island of Romblon , there are 10 of us for this climb. I had been to some parts of the Philippines throughout my climbing career and I had never thought that the travel to this part of the country could be so difficult and is a challenge. My travel going to Sibuyan will be discuss on this part of this blog which entirely is about the Mt. Guiting-Guiting climb plus the sidetrips. There is only one boat going to Romblon per day, and since its the holyweek it is expected that great number of people will take this ride. The boat company does'nt give reservation so its a first come-first serve basis, our EL opted to go to Batangas pier early to buy tickets. She arrived there at around 8-8:30am (Saturday, April 4) but unfortunately all the tickets for the 1st class (supposedly) rooms are sold out. It turns out that there are also scalpers (and I thought these only happens on concerts and sporting events) who later sold these tickets at a higher price. In the end we purchased tickets for the economy rooms, rooms that have reclining chairs for the passengers. Most of us were at the terminal at around noon and the boat leaves at 5:00pm. Most of the time we stayed at the Batangas port terminal repeatedly hearing women shouting services for 'Manicure - Pedicure'. Think of the boredome we bear. Fortunately, the boat arrives on time. I was wondering why the passengers were scrambling to go ahead when there were actually numbers on the seats. Entering the boat, there are already some vehicles (for transport) making the passage to the 2nd floor using the single person size stairs difficult. Seeing the room, my question is now answered. There's are a lot of chance passengers, but since there are limited seats most of them wants to be first on the most comportable space available. The isle, the cafeteria, even above the luggage boards. They are even irritated if you pass-by where they are staying, eventhough its the walkway. I even met some of my climbing acquaintances staying above the ship. The ship is overloaded. Everything seems to be good because we had reserve seats, oh so we thought. Our leftmost seat was occupied by an old man, actually he is reserving it for his wife (all of us are seated side by side). I kindly told the man that that seat is reserved to us, but he wont budge. I still inisted and later on he started cursing me, and we had an argument. When it was already heating up my colleague who is also from Romblon said just to chill down and that we'll just take the seat that the old man have (ours is 110 his is 112). To make the matters worst another man is also occupying seat 112! To make the story short, my colleague ended up taking seat 116(?). Early that night, being tired of waking up early morning, I decided to go to sleep. The boat was starting to rock side to side. Later the boat was swaying the hardest, I'm not sure if its because I'm sleeping or I'm just good at it that I did'nt get dizzy. From all of my sides I can hear people throwing up. Then I realized the boat stop, we were now at Odiongan Port, also at the island of Romblon. Most of the people alighted. It is also then that I heard the news that the air-conditioning for the 1st class room broke down, luck were still on our side. The next day(Sunday, April 5) we arrived at Romblon, Romblon, the Capital. I'm so relieved to be on the ground again. There are two schedule of boat rides from here to sibuyan 9 and 12pm, we decided to take the latter so that we can spend some time checking the place. Describing the island, it looks like a port city that blends the old and new. 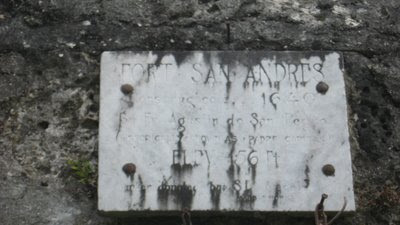 Fort San Andres is located in this city. Theres also an old spanish church were the bell tower was restored with most parts still from the old materials. For those whos not familiar, Romblon is the marble capital of the Philippines. Hence, when your walking at the cemented roads, you will see bits and pieces of marbles (I think they use crushed marble instead of gravel). Then hurriedly we took the boat ride going to Sibuyan, its another two long hours ride. =) When we arrived at Manong Lees residence (the jumpoff), we were greeeted by his wife and Nono his son. Nono is the barangay captain of this place and also the head of the guides. Its good to know that hes a PALMC member! We were allowed to have our packs inside the house, use their kitchen and dining place. We later even slept on their sala. =D. But before that we also took a dip to barangays river/dam, we havent took a bath since yesterday. Imagine our smell. 12 people are on board. Feel so good to take a dip. G2 View from the Dam. Nice blog dude... a total recall for me. i was inducted at this mountain. so little had changed as a view your photos. It took me a while to know that it was you Larry aka HILLBOY who commented at my blog. Its good to know that G2 was kept in pristine condition basing from your assessment. 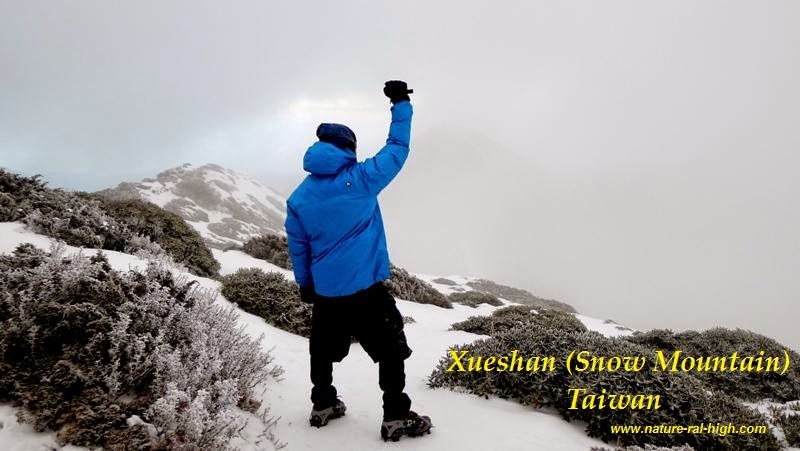 I was so inspired to write after the G2 climb, that I guess I was able to keep my blog in detail yet very concise.=) Its also nice to know that I believe most people find it a good read, specially those that had been there.